Come experience the latest innovations in technology at Integrated Systems Europe 2019! 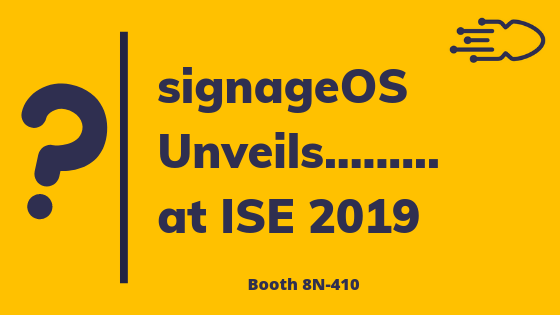 signageOS will be exhibiting at Booth 8-N410 and we look forward to you stopping by. We are bringing with us some big news for the digital signage industry that you won’t want to miss. A major issue looming over CMS companies involves compatibility with hardware/software varieties and the investment that comes with offering these integrations to end-users. Hundreds of CMS companies do not have the time or money to take on integrations such as this resulting in the loss of market share. signageOS is set to release a game-changing solution for the digital signage industry that addresses this dilemma. The introduction of this solution will change the entire process CMS companies must take to tackling these integrations. Utilizing the knowledge base obtained from years of development and maintenance, the company is introducing this knowledge base in a way that greatly assists CMS companies. signageOS expects this new solution to become an industry standard for integrations as this service will drastically reduce the time and cost it takes for CMS companies to develop and maintain integrations. This solution is the result of innovative technology meeting a market ready for disruption. This game-changer will be released at ISE 2019.